During CES, Dirac opened up its suite at the Westgate hotel, so attendees can get a first-hand look at their sound optimization software. Their biggest announcement was their new partnership with gaming headset manufacturer Tritton. 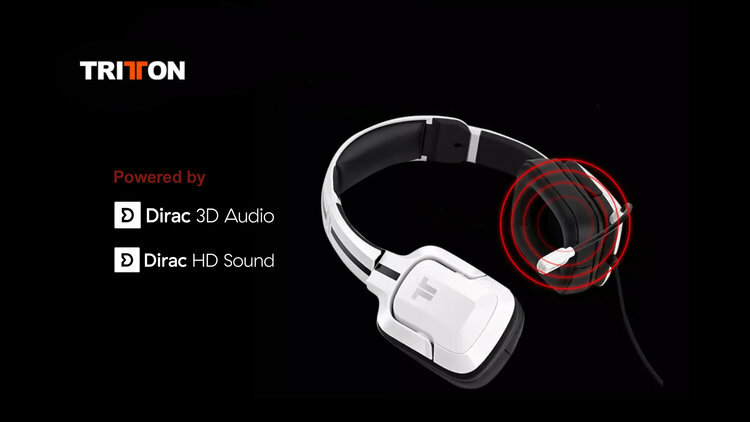 Tritton will be loading their new Kunai Pro headsets with Dirac 3D Audio, a new software that will give players 360-degree sound, immersing them into their gameplay. This will allow players to easily determine where certain sounds are coming from. The Kunai will be a dual use headset, enabling users to easily switch between gaming audio and music listening. The Dirac 3D Audio, which supports 7.1 surround sound, is perfect for video games, while the Dirac HD Sound will be perfect for listening to your favorite music. Dirac also presented their Dirac Bass, their latest audio solution that serves smartphone and portable speakers. Dirac Bass will reproduce bass to sound deeper with higher transparency. The new Dirac Bass is intended to be used in conjunction with Dirac Panorama Sound or Dirac Power Sound. During our visit to Dirac’s suite at CES, we had the opportunity to hear the audio produced using Dirac’s newest suites of sound optimization. First was the Tritton Kunai Pro loaded with Dirac 3D Audio software. What I appreciated about Dirac’s demo was giving us the ability to switch the 3D audio on and off, so that we can accurately hear a difference. From what we heard, the Dirac 3D Audio does a great job of accurately representing the sounds that come from all directions. What made things really impressive was how deep the low ends were, pushing the sounds of explosions and gunfire right into your ears. Next was a demo of Dirac Bass, which really amazed me. I was first shown a basic $40 speaker from IKEA. Sound quality was acceptable, with a flat and even sound profile, that had no real distinction between highs, mids, and lows. Once the speaker utilized Dirac Bass, you can really hear the difference. This went beyond using an equalizer preset that was set to favor the lows, which would typically result in the highs and mids being drowned out. Dirac Bass gave you a deep sounding low while keeping the other tones intact, with no distortion and overall evenness. The real tipping point that showed just the kind of optimization Dirac can produce was when they demoed Dirac Bass coupled with their Dirac Panorama Sound. Instead of using a cheap portable speaker, they ended up using a Bose portable speaker. Now we know that Bose produces quality sound products, but what Dirac did was take an already great sound speaker and brought it up to eleven. It was almost jaw-dropping to hear this panoramic sound coming from such a small speaker. It gave the audio more depth and more feeling to it and made it feel as if the sound fully engulfed me. Of course, it didn’t end there. Dirac demoed their software on a Razer smartphone. This 6-inch smartphone, with two-front facing speakers, was producing a powerful panoramic sound that will take gaming or entertainment to a whole new level.